I bought your cookie dough from my niece, who attends a local elementary school. I tried four flavors of dough — they were all great, easy-to-use, and made wonderful tasting cookies. The idea of buying something useful, rather than looking through books full of items you can buy at discount stores for half the price, was very nice. I know we will be selling your cookie dough next year. Your company has a top-notch product — keep up the good work. 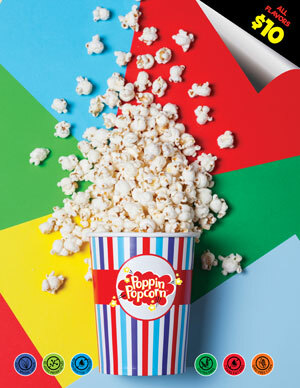 This brochure includes half-gallon bags of the following popcorn flavors: Buttery Caramel, Cheesy Cheddar, Three Cheese, Cheddar Jalapeño, Chicago Style, White Cheddar, Cheddar & Sour Cream, Kettle Corn, Movie Theater Butter, and Cinnamon Toast.